If you’ve never heard of a sous vide machine, you’re not alone. While they’ve been known for a while in the foodie circle, their usefulness is just now being recognized by the general at-home cook. Sous vide (pronounced “soo-veed”) is a French term that means “under vacuum”. Basically, what it does is allow food to be cooked in a vacuum-sealed bag submerged in what to retain flavor and moisture. Personally, that’s my favorite reason to have one. 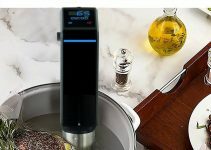 The Sous Smart SSV2700 Sous Vide Precise Cooking Immersion Pod comes with all the features you could hope for in a sous vide machine. The skirt is heat-safe and stainless steel, so you can rest easy that your cookware won’t be damaged during the sous vide process. The tank capacity is 15L-19L, and the adjustable clamp extends its versatility. The Sous Smart SSV2700’s LCD control display and included cooking guide are great for people who’ve never used a sous vide machine before—perfect for newbies. The Sous Smart SSV2700 is an excellent, budget-friendly sous vide cooker! What I really like about the SSV2700 is how evenly it cooks. 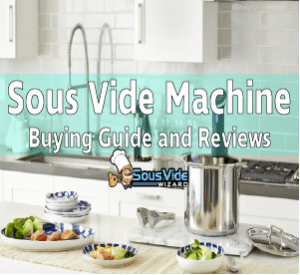 After all, that was the original intention behind the sous vide machine—to make smooth soups, perfectly tender meat and delicately cooked vegetables. A big part of that perfect execution is the machine’s 360-degree circulator pump. This is so important, because what makes the sous vide cooking method work is the way the water the bag of food is bathed in is circulated. Even circulation means your food comes out evenly cooked and so, so yummy. If you like your meat to be juicy on the inside, you can’t find a better cooking method that sous vide. Like many of you, I haven’t been using sous vide machines that long. That’s why the cooking guide and LCD controls are so important to me. When I’m using a new machine, I like to know exactly what I’m doing before I get started—and while I’m doing it. These aspects allow for that, which is nice. Another thing I love about the Sous Smart SSV2700—and I know moms and dads will understand this—is the fact that it’s safe. 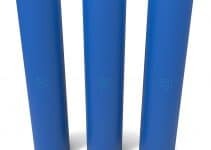 The SSV2700 is ETL listed. What that means is that this product meets North American safety standards. That means that when you use it as directed, it’s safe. If you have kids in the house, that is so important. There are a lot of things to like about the Sous Smart SSV2700. It’s stainless steel and heat-safe. That means you won’t leave it and come home to a melted appliance or a ruined pot. The controls make things really easy. The display is very readable, so you don’t have to worry about having to squint to read. Also, you can easily adjust the settings, which is always a plus—especially if you’re the type, like so many of us, that likes to try out a bunch of different recipes. Perfect for foodies and those with gourmet aspirations. It cooks food very evenly, because if it didn’t cook evening, what would even be the point of having one? Remember, even cooking is what makes a sous vide machine superior to, say, cooking meat in the oven or in a pot sans sous vide. Even cooking is probably the biggest thing that sets apart sous vide from other cooking methods. Because it clips to your cookware, you don’t have to worry about it sliding off. This goes along with the even cooking thing. If the sous vide slides around, you’re not going to get an evenly cooked dish. There are a few cons, but not too many. The cable isn’t replaceable, because it’s hardwired. However, this isn’t that big of a deal, because many appliances don’t even have this feature. It’s just a nit-picky thing to note. You have to set the temp and time every time you use it. If you’re using the cooking guide, that won’t matter very much, though. Some customers complain that the SSV2700’s temp is slightly off—but others think it’s fine. 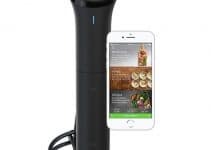 The Sous Smart SSV2700 is an affordable sous vide machine that’s great for both sous vide novices and experts alike. With its stainless-steel construction, you don’t have to worry about it falling apart after a few uses. And the LED display is a gem. The SSV2700 is a sous vide dream.